Donate now to support children a better future. Your 10 pesos can provide everything children need to flourish such as food, health, water education. 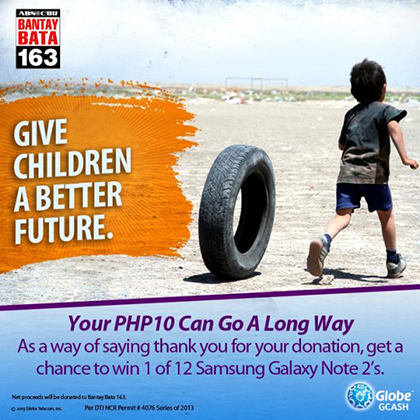 Donate P10 GCASH to BantayBata & get a chance to win 1 of 12 Samsung Galaxy Note 2’s. Select GCASH; using your phone’s keypad, type 8 (for Postpaid) or 7 (for Prepaid) and press send/reply to continue. Transfer funds from your bank account online at www.globe.com.ph/gcash, via BancNet ATMs or through any of over 7,000 GCASH Outlets nationwide. For more information on how to fund your GCASH wallet, please visit www.globe.com.ph/gcash. Every 10 pesos worth of GCASH entitles you to 1 raffle entry. Grand Draw to be held on June 28, 2013. Visit GlobePH Facebook Page for more details and latest updates.